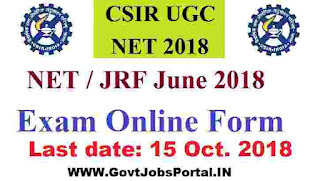 The UGC NET CSIR Online applications for JRF/NET is out for Dec. 2018. All Indian candidates are invited twice in a year for this UGC NET CSIR Examination. The press Notification for the second time for this year is out now. The official Notification is also made available on HRDG website (www.csirhrdg.res.in). UGC NET Department provide Research Fellowships to bright young men and women for training in methods of research under expert guidance of faculty members/scientists working in University Department/ National Laboratories and Institutions in various fields of Science. Only bonafide Indian citizens are eligible for this test. The procedure for applying this CSIR Examination will be activated on 25th Sept. 2018 and will remain activated up to 15 Oct. 2018. You all have to apply online between these dates. More information about this CSIR UGC NET Examination is given below in this article. Read it carefully till the end before applying online. Rs.28,000 Per Month for the 3rd year. 1. Those who have a M.Sc or equivalent Mater degree/ Integrated BS-MS/BS-4 years/ BE/ B.Tech/ BPharma/ MBBS with at least 55% marks for General (UR) and OBC candidates and 50% for SC/ST, Persons with Disability (PwD) candidates can apply. 2. Aspirants those who have a degree in B.Sc (Hons) or equivalent or students enrolled in Integrated MS-Ph.D program with at least 55% marks for General (UR) and OBC candidates; 50% marks for SC/ST, Persons with Disability (PwD) candidates are also eligible to apply. 3. Applicants registered for M.Sc or having completed 10+2+3 years of the above qualifying examination as on the closing date of online submission of application form, are also eligible to apply. 4. Candidates possessing only Bachelor’s degree are eligible to apply only for Junior Research Fellowship (JRF). Age Bond: All applicants having age less than 28 years can apply for this CSIR UGC NET Exam 2018. 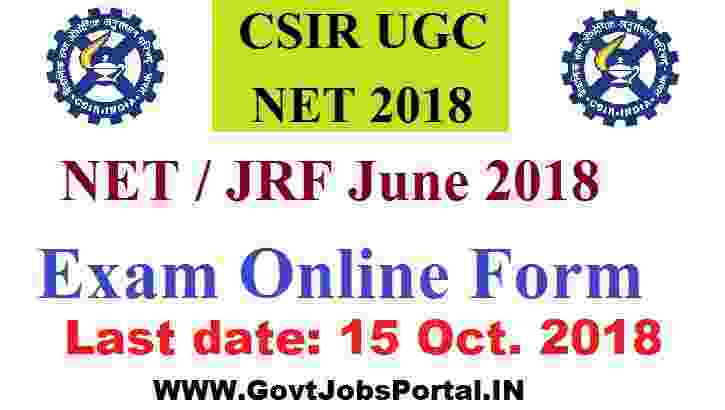 What is the Application Fee for applying this CSIR UGC NET Exam 2018? 25TH Sept. 2018 is the Opening Date to apply. 15th Oct. 2018 is the Last Date to apply.